Many musicians dream one day of performing live in front of thousands of people. Or recording their own album in which they sing or play an instrument. Often we as artists not only enjoy creating music, but we also love to give it to others. We want our music to be heard and enjoyed. To create a song or compilation of songs to be heard by a large audience, it takes much more than just a musician with her instrument. After years of practice and hours of instruction, an artist who strikes out to become a performer must have an army of people behind her who work hard and support her endeavor. It takes hundreds of people to create a successful band or artist, and here we’d like to discuss the different careers that accomplish just that. An audio engineer records, modifies and mixes sound in a music studio. This music is used for artist or band records, television, radio or film. Some audio engineers also work on the research side of sound, developing new technology for the field or creating new ways to use sound. Typically an audio engineer needs a bachelor’s degree in their field, especially if they want to work in the research field. Common focuses in education are computer science, engineering, acoustics, and physics. Video production covers a large range of different types of jobs. It is mainly the same job as filmmaking, except it is not done on film stock, but instead recorded digitally. Not only do you record video, but you also edit it to create a finished product. Whether you are working as a wedding videographer or filming a movie, often your responsibility is to create a product from start to finish. 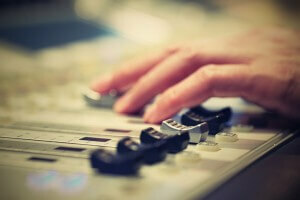 In the world of music, a video producer would potentially focus on concerts and music videos for television. In the creation of recorded music, the music producer is involved in the creative direction, manipulation, quality and vision of the song or album. They are there to oversee the music itself. They often make decisions about the album overall, or they can be responsible for only a song or two. They work in conjunction with the artists, audio engineer and executive producer to create recorded music, typically in a studio. Often music producers are experienced composers, arrangers or musicians. The executive producer of an album has the role of an overseer. He or she focuses on the big picture and is employed in both music and video production. Unlike the music producer, the executive producer is responsible for the overall creation of an album, from marketing and sales, scheduling, distribution, copyright and touring. Music execs often have a great deal of experience in the industry, but not always in relation to music. Often execs have a great deal of experience in the business world, as their main job is to create profit from artists and bands. Individuals who market and advertise for musicians come from all walks of life. It can be advantageous for them to have a background in music themselves, but more importantly they must understand advertising and business. To be a successful musician, whether it is as an individual jazz saxophonist or a song writer, you need someone on your team who can deliver your finished product to the masses. Music advertisers oversee finished cover to a CD, the name for an artist’s tour, and the commercials sent out over television and radio. A music industry sales rep will also be familiar with the artist and his music, but will have more experience and sales and marketing. After a record is produced, it is his job to get in the hands of the public and create income for the team. Music law (not an actual academic study) covers a number of different types of law that relate to the music industry. As in other areas of law, the music industry needs lawyers and a legal force that represents artist, bands, and their record labels. Often, each part of the team will have its own lawyer. As with other aspects of law, lawyers involved in the music industry must follow the same educational and licensing requirements for his or her state. This often requires a good amount of schooling, along with passing a rigorous test to qualify for licensure. When an artist or band decides to go on tour, a whole army of people is needed to create a successful show. Some of the main jobs during a concert involve creating not only quality sound (which is where sound technicians come in) but also an entertaining concert experience. People are needed to set up the stage, work before, during after with lighting, and even create explosions with pyrotechnics. In addition, drivers are needed to bring all the equipment and people to and from each concert, makeup artists prepare band members and costume designers create fashions for the on stage performance. Two key jobs that are needed in every stage performance, whether it be a rock concert or a piano recital, are lighting and effects. The lighting engineer is responsible for setting up all lighting for the stage, and making sure that lighting works properly throughout the entire concert. The engineer often works under the lighting director (a more experienced lighting engineer who supervises the show) and works in conjunction with the effects engineer. The effects engineer is responsible for creating entertainment for the audience (a background for the artist or band). From fireworks to large television screens and stage props, the effects engineer creates a set from which the artist performs. From working behind the scenes at a high school recital, setting up the stage for a rock concert, or recording a music album, every aspect of a musical performance is scheduled and analyzed. A great deal of people are needed, from varying backgrounds, experience and education, in order to create a successful musical experience. Artists and band members bring their music and talent to the table, but without the help from many others, sending their music out to the world would be impossible. Working in the music and performing industry often takes a great deal of hard work, but know that the types of work and education vary greatly. If you love music but have never laid your hand on an instrument, or can’t even sing a tune, there are jobs that require experience in many other fields. Without these key people, artists’ music would go unheard.